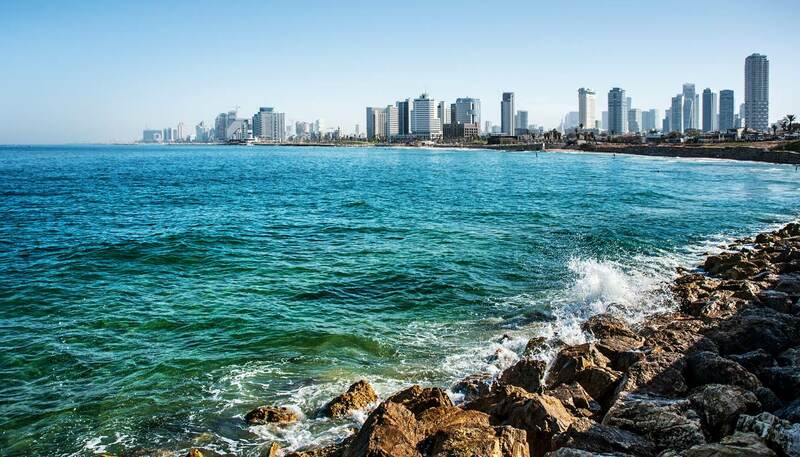 There are plenty of choices for accommodation in Tel Aviv, but most of the big, smart hotels are across the street from the seafront promenade, several with entrances along Hayarkon Street. Room rates are on the high side in all price brackets, but hotel standards tend to be high too. Prices come down and establishments generally become more modest the further they are from the beach and there are several good, mid-range places a couple of blocks inland. A particular treat is the abundant and varied Israeli breakfast, sometimes included in the room rate. These Tel Aviv hotel prices are the starting prices for a standard double room and include taxes and breakfast unless otherwise specified. The longest standing of Tel Aviv’s upmarket beachfront hotels, the Dan's unusual low-rise building and colourful exterior (on the beach side) makes an interesting change to the identikit high-rises that surrounds it. However, because of its age, some rooms seem to be at a lower standard than the price and reputation suggest. A gargantuan 5-star hotel, much of the David InterContinental’s clientele are here for business, but don’t let that put you off – a night spent here feels surprisingly intimate. Just across the road from Charles Clore Park and the beach, it’s a few minutes’ walk from Carmel Market and the Yemenite Quarter. Good value, apart from expensive Wi-Fi. Telephone: +972 3 795 1111. Housed within a gorgeous, buttercup yellow building that’s almost as old as Israel itself, The Rothschild is a real sanctuary thanks to its tranquil courtyard and sympathetic décor. Service is top quality, as is the food served in the restaurant. Elsewhere, the emphasis is on natural – including the toiletries. Telephone: +972 3 957 8888. The Alexander is a seriously chic place to sleep, veering between starkly modernist designs and Mediterranean styles. It also boasts stunning sea views. Rooms are comfortable and well appointed and there’s a glamorous rooftop bar that has proved a hit with Tel Aviv’s cool crowd. Telephone: +972 3 545 2222. Formerly a Bauhaus cinema, this stylish little hotel is right in the city centre, just off Dizengoff Square. The comfortable, attractively furnished rooms have plenty of amenities, among them a fridge, beach towels and free Wi-Fi, and there’s a free sauna, rooftop terrace and business lounge too. Telephone: +972 3 520 7100. This is a hotel where art takes centre stage. The décor combines white walls with bright furniture and even brighter artworks, all of which are for sale. Rooms are pleasant and comfortable and there's a restaurant serving excellent local fare on site. All the city centre attractions are close by. Telephone: +972 3 545 3131. It might be self-catering, but the Andromeda Hill is right in the heart of Old Jaffa. The accommodation varies from studios to four-room suites, and the minimum stay is four nights (some guests stay for several months). A swimming pool, health club and business facilities are all on offer, and all the apartments have fully equipped kitchens. Telephone: +972 3 683 8448. A basic combination of hostel and hotel, The Beachfront is a little shabby and has amenities that some may find inadequate, particularly the dormitory-style rooms. But there’s hardly anywhere cheaper to stay in Tel Aviv, and it’s right on the beach. Breakfast is not included, but is offered at a restaurant next door. Telephone: +972 3 744 0347.